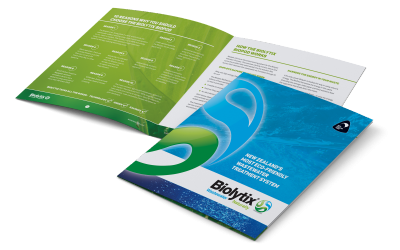 At the heart of the Biolytix wastewater treatment process is the BioPod. The BioPod is a unique and patented method of treating household wastewater to a level that is suitable for beneficial irrigation of lawns & gardens. The BioPod works by mimicking the way nature breaks down waste which is far more efficient and less energy intensive than conventional wastewater treatment. Why use high energy machines when nature can do the work for us? Inside the BioPod is a layered filter bed, engineered to quickly separate the solids from the liquid sewage and to provide a stable environment for the micro and macro organisms that break down the separated solid waste into a stable humic product. The organisms, including tiger worms introduced to the BioPod on commissioning, ensure the entire filter bed is naturally aerated, eliminating the smell often associated with septic tanks and with mechanically aerated wastewater systems. The organisms feed on the waste exactly as they would in nature. By consuming the waste the organisms remove the vast majority of contaminants from the wastewater. The engineered ecosystem inside the BioPod can be sustained indefinitely with solid material repeatedly broken down and resulting humic material becoming a part of the filter and part of the filtration process. The worms and other treatment organisms simply breed and replenish themselves. Because of the relative lack of mechanical components in the filter bed the BioPod only needs one annual service (most competing systems require 3-4 services each year). Near the bottom of the tank is a geofabric layer, which removes any residual fine solids larger than 80 micron size. This purified and filtered water is then ready to be pumped into the garden for further polishing and where it can be utilised as a beneficial irrigation resource. A major advantage of the BioPod is that it is not reliant on complex or expensive machinery to run. It has a minute, but robust, low energy and low volume air pump which ensures the ambient air in the BioPod is constantly refreshed providing an abundance of available oxygen supply for the aerobic organisms that do all the work in the filter. It blower only consumes 0.12 kWhours per day (approximately 3 cents per day) which is very low compared to other conventional aerated wastewater systems, which typically consume 10 to 20 times this. In addition to this the air pump is whisper quiet. We have field and factory tested installed BioPod and recorded maximum noise of less than 40dB from a distance of just 1m. By comparison the blowers used on aerated wastewater systems can be very noisy and can operate 24 hours a day. In this middle of the treated wastewater compartment is the disposal pump which operates on demand (typically less than 30 minutes per day) to dispenses treated effluent from the BioPod out to the irrigation system. The disposal pump is powerful enough to pump more than 50m vertically which allows even the most topographically challenging sites to be irrigated. 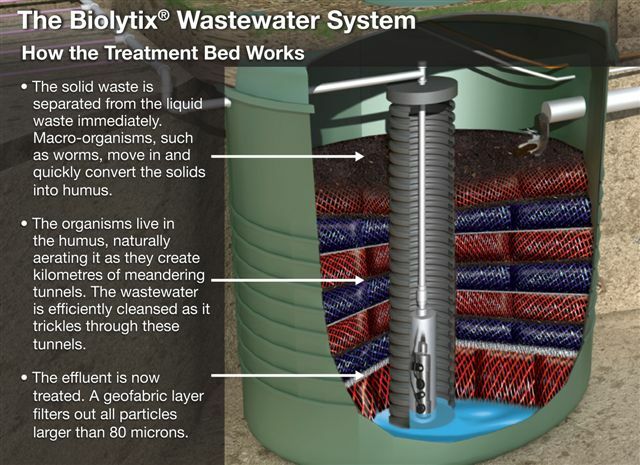 All wastewater treatment is completed in a single, lightweight, polymer tank which makes the BioPod the most compact biological treatment system in the world that we know of. 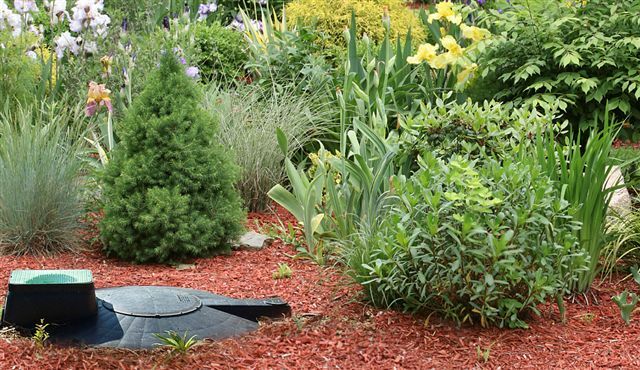 The single light weight tank means that it is it easier and cheaper to transport, less disruptive to install and is visually unobtrusive when installed in your backyard. Despite the light weight the polymer tank is tough and is engineered to exceed all the durability requirements in the Australia New Zealand septic tank standard 1546.1. To put the relative size in perspective a typical sand filter system (with a septic tank, sand filter bed and pump chamber) would physically take up an area approximately 9 times larger than the Bio-Pod. A typical aerated system will require an area 2 to 4 times the size of the BioPod. The BioPod is extremely reliable but has an audible and visual alarm installed to let you know of any irregularities within the system.